Adrian IV (Latin: Hadrianus Quartus; c. 1100 – 1 September 1159), born Nicholas Breakspear or Breakspeare, was Pope from 1154 to 1159. Breakspear was an English priest of the Roman Catholic Church and the 170th Pope. He is the only Englishman ever to have been Pope. Breakspear was born near St. Albans in Hertfordshire in England. His father was Robert, who later became a monk at St Albans Abbey. Nicholas himself, however, was not yet to attend the monastery. He was told by the Abbot to 'wait to go on with his schooling so that he might be considered more suitable' (Abbey chronicles). He did not wait and went instead to Paris. He finally became a canon regular of the cloister of St. Rufus monastery near Arles. He rose to be Prior and soon was unanimously elected Abbot. This election has been traditionally dated to 1137. Evidence from the Abbey's chronicles suggests it was about 1145. In 1146, Breakspear was made Bishop of Albano. Pope Eugene III raised Breakspear to the rank of Cardinal in the same year, 1146. From 1152 to 1154, Cardinal Breakspear was the papal legate to Scandinavia. 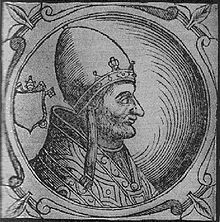 Cardinal Breakspear was elected pope on 3 December 1154. He chose the name Adrian IV. He at once tried to bring down Arnold of Brescia, the leader of the anti-papal faction in Rome. Disorder in the city led to the murder of a cardinal. Adrian, shortly before Palm Sunday 1155, took the step of putting Rome under interdict. The Senate (City Council of Rome) then exiled Arnold. Pope Adrian was involved in Italian and European political disputes. A proposed alliance with the Eastern Byzantine Empire came to nothing. Adrian signed a Papal Bull (official letter) urging King Henry II of England to invade Ireland and bring the Celtic Christian church into the Roman system. A dispute with Frederick I, Holy Roman Emperor was happening when Adrian died. He was said to have died from choking on a fly in his wine. It was probably of quinsy. ↑ 1.0 1.1 "List of Popes," Catholic Encyclopedia (2005); retrieved 2011-11-3. ↑ Raby, Richard (1849). Pope Adrian IV: An historical sketch. By Richard Raby. Richardson. p. 3. ↑ 4.0 4.1 Chisholm, Hugh (1910). The Encyclopaedia Britannica: A Dictionary of Arts, Sciences, Literature and General Information. Encyclopaedia Britannica. p. 215. ↑ Mackie, John Duncan; IV, Pope Adrian (1907). Pope Adrian IV: The Lothian Essay, 1907. Blackwell. p. 13. ↑ Bolton, Brenda; Duggan, Anne (2003). Adrian IV, the English Pope, 1154-1159: Studies and Texts. Ashgate. p. 25. ISBN 978-0-7546-0708-3. ↑ 7.0 7.1 7.2 7.3 7.4 "Pope Adrian IV", Catholic Encyclopedia; retrieved 2011-11-3. ↑ The Penny Cyclopaedia of the Society for the Diffussion of Useful Knowledge. Charles Knight. 1833. p. 181. "Pope Adrian IV". Catholic Encyclopedia. New York: Robert Appleton Company. 1913. This page was last changed on 13 April 2018, at 08:55.